Brief: The Beats by Dre brand may not be particularly well-liked with audiophiles, but the Solo fits the definition of a portable headphone to the dot, with some rather enticing extras thrown on top. 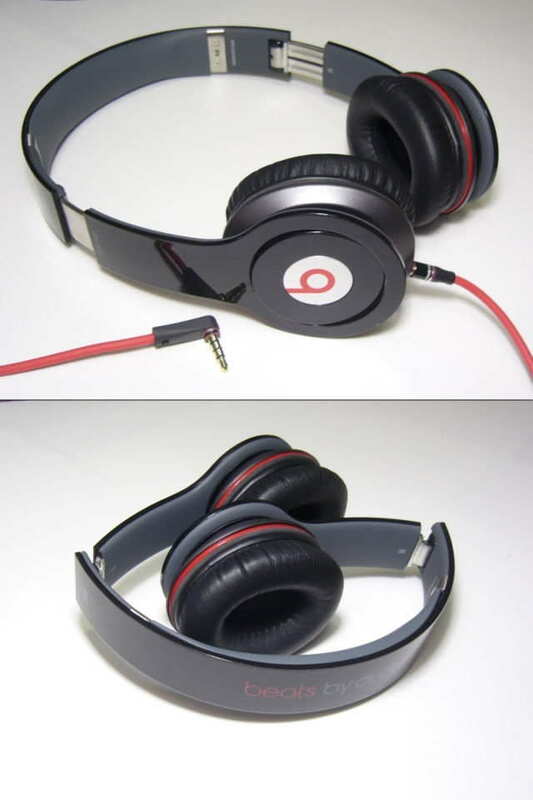 Build Quality (7/10): The construction of the Beats by Dr Dre Solo uses large quantities of matte and glossy plastics throughout the structure. There is a bit of metal reinforcing the lower part of the headband but everything above the hinges is plastic – an odd (and fragile) design choice for a headphone supposedly intended for portable use. The hinges themselves feel tight and precise but the rubber padding on the inside of the headband is quite cheap-looking next to the luxurious pleather of the B&W P5 and Phiaton MS400 and the vented cloth padding of the V-Moda Crossfade LP. The Solo also exhibits mild driver flex – a crinkling sound that results from air pressure deforming the driver – which can, at times, be annoying. The cable, on the other hand, is nice and thick, with a low-profile L-plug on the far end. On the headphone side, the 3.5mm connector is not recessed so pretty much any replacement cable – including the $5.49 V-Moda ones and any 3.5mm stereo interconnects – will work. Comfort (8/10): The Beats Solo is a supraaural headphone through and through, with the pads measuring just a hair smaller in diameter than those of the HD25-1. The padding isn’t as soft as that of the Phiaton’s MS400 but the cups have enough rotational freedom to achieve a good seal regardless. Clamping force is average and the long-term comfort of the Solos really is very similar to that of the HD25-1. One small annoyance is the rubber headband, which latches on to hair (via friction) if the headphones are yanked off quickly (as I tend to do when A:Bing several sets). Isolation (8.5/10): While the fit of the Beats Solo is very similar to that of the HD25-1, isolation suffers slightly as a result of the lighter clamping force. The isolation of the Solo is somewhere between the looser-fitting Phiaton MS400 larger V-Moda Crossfade LP – not class-leading but plentiful for use on the go. Sound (6.5/10): Compared to the underperforming V-Moda Crossfade LP, there are certainly good things to be said for the Beats Solo – the bass, for example, is cleaner, tighter, and quicker, and overwhelms more rarely than that of the Crossfade or Sony XB700, though a bit of the depth and rumble is missing as well. The low end of the Beats is impactful and aggressive – more so than the softer-sounding Phiaton MS400 – but lacks the texture and resolution of the latter. It’s a strange way of presenting bass, portraying all of the impact but only some of the musical information found below 100Hz – a phenomenon that’s sometimes referred to as ‘one-note bass’. On one hand it does reduce mid-range bleed – the Solos fare better than the Crossfade and XB700 and on-par with the Phiatons in that respect. On the other hand, I don’t feel that the bass of the Solos is true to source, especially at lower volumes, glossing over detail for the sake of moving more air. The attack/decay times are a bit too quick for the amount of bass the Solos attempt to portray and there is occasionally a closed, cave-like feel to bass notes. The plasticky echo from the housings doesn’t help things, either, and the pleather pads of the Beats sometimes seal too well, flexing the drivers out of shape and degrading sound quality. The midrange of the Beats Solo, like the bass, is not brilliant but remains fairly inoffensive. Bass bleed is present but the midrange is still relatively crisp and clear – the Beats are actually slightly lean-sounding, lacking the full-bodied warmth of the Phiaton MS400 and the thickness of the B&W P5. The Beats do sound significantly more crisp than the V-Moda Crossfades, giving more edge and bite to guitars and better definition to vocals, but still lack clarity and detail next to the MS400. The result is a sound that’s slightly smoothed-over and a bit more flattering when it comes to poorly-recorded tracks. The treble transition is free of harshness and sibilance and there certainly are more ‘valleys’ than ‘peaks’ to the upper midrange and treble response of the Solo. A bit of information is also missing at the top, resulting in a slightly dark and muffled overall treble presentation without much air, but at least the treble is devoid of the metallic tinge common to more treble-heavy headphones. Presentation is perhaps where the Beats by Dr Dre Solo disappoints most – its soundstage is slightly larger than that of the Sennheiser HD25 but the Sennheisers are much better at separating out spatial cues, largely due to their greater clarity and detail. The soundstage of the HD25 may be small but the space is at least somewhat spherical while the Beats sound both small and flat. Like the V-Moda Crossfades, the Beats get overwhelmed on busy tracks, more so due to the congested presentation than overwhelming bass. The poor layering is also partly the fault of the relatively small dynamic range – the Beats have trouble relaying subtlety, which is made especially obvious in direct comparisons with the MS400 or B&W P5. Interestingly, Monster didn’t squeeze every last bit of output from the Beats Solo – in terms of efficiency they are somewhere between the easier-to-drive Phiatons and the slightly more demanding HD25-1. However, greater volumes are required to get good midrange presence with the Beats, which may explain the hearing loss statistics in today’s teenagers. Are the Beats Solo particularly poor headphones in my opinion? No – as with the Beats Tour IEMs, there is value for those who actually like the congested presentation and shouty dynamics of the headphones. The sound signature of the Beats will never be called ‘hi-fi’ in the strictest sense but there’s no point in judging a sound signature so I can only say that audio fidelity is not a strong suit of the beats. Value (6/10): Much-maligned around Head-Fi the audiophile community, the Beats by Dr Dre line is neither tuned nor marketed in a way that would appeal to audiophiles. However, like B&W, Monster seems to have done a bit of research on the kind of sound that remains engaging out in the real world. Sadly, while the B&W P5s sound like a high-end product that was simply tuned in a way that sacrifices fidelity for inoffensiveness, the Beats Solo seem to be limited by the capabilities of the drivers themselves, which are easily overwhelmed and not quick enough to cope with complex tracks. I often hear people say that the Beats are ‘only good for certain genres’ but that approach makes little sense – the honest thing to say would be that the Beats are good enough for certain genres – namely those that don’t feature multiple simultaneous sonic cues. Still, I can honestly say that the sonic performance of the Beats, while far from outstanding at $180, does not offend me (which I can’t say about the Crossfades). However, even with sound quality out of the picture, I struggle to see enough value in the Solos to justify the asking price when the better-built, more comfortable, and arguably prettier Phiaton MS400 costs about the same.